In a general sense, all things being equal the lion dominates the hyena. Indeed in some parts of sub-Saharan Africa (e.g. Ngorongoro crater) the lion depends substantially on hyena kills and responds to the calls of hyenas feeding3 pushing the hyena off kills. The hyenas wait until the lions have finished4. But unusually the opposite can take place – hyena forcing lion off kill. Lions feeding can see off most scavengers. 21 hyenas feeding at a kill (an eland) 3 young male lions and 4 lionesses appropriate the kill from them. When only one male lion remained the hyenas took back their kill. Usually, however, lions ignore hyenas while hyenas react to the presence of lions. It is said that the hyena fears the male lion but not the lioness. This indicates the general status between the two. Under certain circumstances the lion will attack a hyena and kill it5. Hyena deaths by lion attack can be high as is the case in Etosha National Park (71% of hyena deaths). 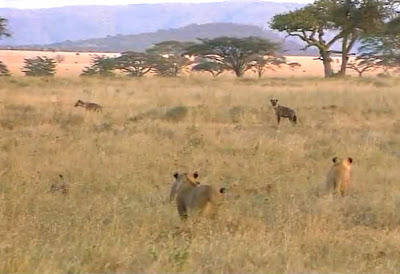 Hyenas deal with this by forming groups or mobs to defend their territory against lions6(see table above). There are a number of videos on the Internet of lions fighting with hyenas and a mob of hyenas attacking a lion or lions. Two are below. They generally support the argument that the individual lion dominates the individual hyena but when groups form the dynamics eventually shift. Groups of wild dogs, a relatively small animal, can entrap and kill the tiger for instance. 1 Nowak, Ronald M. (1999). Walker’s Mammals of the World. Baltimore: Johns Hopkins University Press.